Andy Rathbone » How do I go back to Internet Explorer 8 from IE9? How do I go back to Internet Explorer 8 from IE9? Q: I recently upgraded to Internet Explorer 9. My bank’s website doesn’t work very well with Internet Explorer 9. How do I uninstall Internet Explorer 9 and go back to Internet Explorer 8? A: Microsoft began offering Internet Explorer 9 on March 14, 2011. Like any new piece of software, some people love it and some people hate it. If Internet Explorer 9 doesn’t meet your needs, it’s easy to retreat to your previous version. For Windows 7 owners, that’s Internet Explorer 8. Click the Start button, and type Programs and Features in the Search box along the Start menu’s bottom edge. 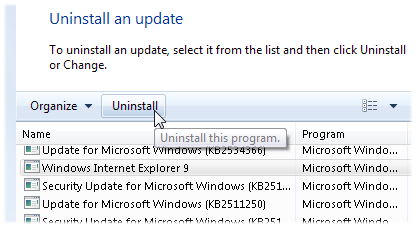 When the Uninstall or Change a Program window appears, click View Installed Updates in the left pane. Right-click Windows Internet Explorer 9, click Uninstall, and when prompted, click Yes. Click either Restart Now to finish the job, or Restart later to remove Internet Explorer 9 the next time your restart your computer. After you uninstall Internet Explorer 9, the previously installed version of Internet Explorer, usually Internet Explorer 8, will return to life and handle your browsing chores. Windows installs it automatically; you needn’t fuss with trying to reinstall it. Or, if you prefer, install an alternative browser like Firefox or Chrome. Internet Explorer isn’t the only browser in town. Installing an alternative browser isn’t an all-or-nothing affair. The new browser stocks itself with any bookmarks or favorites you’ve created in Internet Explorer; then it waits in your Start menu for you to give it a try. You can switch between different browsers, seeing which works best for the work you do. You keep even run several browsers on your computer simultaneously, seeing which one you prefer for different tasks. Or, you can stick with one. But installing a second browser won’t mess up your settings in your other browser. Note: Unlike most updates sent through Windows Update, Internet Explorer 9 can be removed safely. But don’t try to remove other updates you see. Almost all of those updates plug serious holes in Windows. Removing those updates reopens those security holes, leaving your computer vulnerable to security problems. Posted: October 24th, 2011 under Internet, Software, Windows 7.